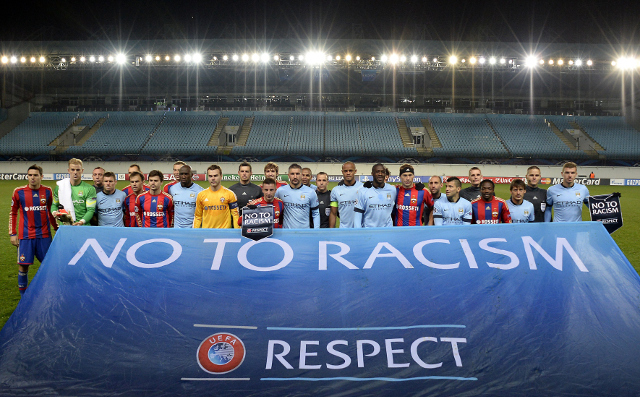 Russia have had plenty of problems with racism in football in recent years. A top Russian official – who adjudicates in racism cases in the country – has sensationally claimed that black players are not victims of racism, if they respond to the abuse with an offensive gesture, according to the Guardian. FIFA Shows Absurdity Again With Lesser Ban For Racism Than Spitting! Artur Grigoryants, head of the Russian Football Union’s disciplinary committee, made the startling statement in response to questioning about why black players in the country were being handed bans for their reactions to the hostile crowds, that seemingly now plague the game in the country. Grigoryants referred particularly to the case of former Blackburn Rovers defender Christopher Samba, who was banned for “losing control,” despite the racist abuse he received from Torpedo Moscow fans in September last year. In December, Rostov midfielder Guelor Kanga was incredibly banned for three matches, after showing his middle finger to Spartak Moscow fans. But for those concerned about the 2018 World Cup, which will be hosted in the country, Grigoryants has made assurances that discrimination is not a major problem in Russia, saying there are only, “rare cases of racism” within stadiums.